Line a baking tray with wax paper and set aside. Pour the cereal into a large bowl. In a microwave-safe bowl, place the frosting and chocolate chips. Microwave at 70 percent power for 90 seconds and stir. Continue to microwave at 15 second intervals, if necessary, until the mixture is fully melted. Add vanilla and stir very well. Pour the mixture over the cereal and gently stir to coat. Transfer the coated cereal to a gallon-size zip-top bag. Add the powdered sugar and 3 tablespoons sprinkles and shake to cover the cereal. Pour the cereal onto the prepared tray and let cool. Line another baking tray with wax paper and set aside. Fill each of 4 decorating bags with 1/4 cup of candy melts in each of the 4 colors. Work with only one color at a time. Place a bag of candy on a paper towel in the microwave, and microwave for 90 seconds at 70 percent power. Massage the bag and continue to microwave at 15-second intervals until fully melted. Snip off 1/4-inch from the tip of the bag. Pipe numbers or confetti on the prepared baking tray. To make the candles, pipe a stripe in any color candy melt, then pipe the flame on top in yellow. Let the candy harden at room temperature for 30 to 60 minutes. Peel from the wax paper. Stir together the piped candy, the coated Chex™ cereal and any additional candies or confetti sprinkles you desire. This recipe requires 4 disposable decorating bags. Choose any colors you like for the candy melts, but don't forget the yellow for the candle flames. Customize your mix with easy homemade candies... we'll show you how! The detail-oriented are always appreciated around birthdays. Especially when they present colorful, personalized candies that pop against sweet, coated Chex™ mix. So whip up this surprising and fun snack to serve at a party, or package it in jars to give as a gift! First, prepare the coated Chex™ base, trying to limit how much you eat along the way (I say, as I cast a sidelong glance. This stuff is really, really good). Line a baking tray with wax paper and set aside. Scoop six cups of Chex™ cereal into a large bowl and set that aside, too. In a microwave-safe bowl, place a cup of white frosting and a half-cup of white chocolate chips. Nuke for 90 seconds at 70% power, stir, and if necessary, microwave for another 15 seconds until the mixture is fully melted. Stir really, really well. Pour the melted mixture into the bowl with the Chex™ and gently stir to coat the cereal. Scrape the whole lot into a gallon-size zip-top bag. It helps to fold down the top of the bag while you’re scooping in the mixture. Add the powdered sugar and sprinkles and gently shake. Spread the coated cereal onto the baking tray to cool. Now you’re ready to make your colorful, personalized candies. Line another baking tray or trays with wax paper and set aside. Fill each decorating bag with 1/4-cup of candy melts in one of the four (or more) colors. Because candy melts harden pretty quickly, work with only one color at a time. Place one bag of candy on a paper towel in the microwave, and microwave for 90 seconds at 70 percent power. Massage the bag and continue to microwave at 15 second intervals until fully melted. Snip off only 1/4-inch from the tip of the bag so you have good control when piping. Pipe numbers (sigh, I remember 27) or confetti on the prepared baking tray. To make the candles, pipe a stripe in any color candy melt, then pipe the flame on top in yellow. Make any other designs you want, too: confetti dots, streamers, and so on. Let the candy harden at room temperature for 30 to 60 minutes, then peel from the wax paper. You should have about a cup of candy designs when you're done. Now, mix it all up! 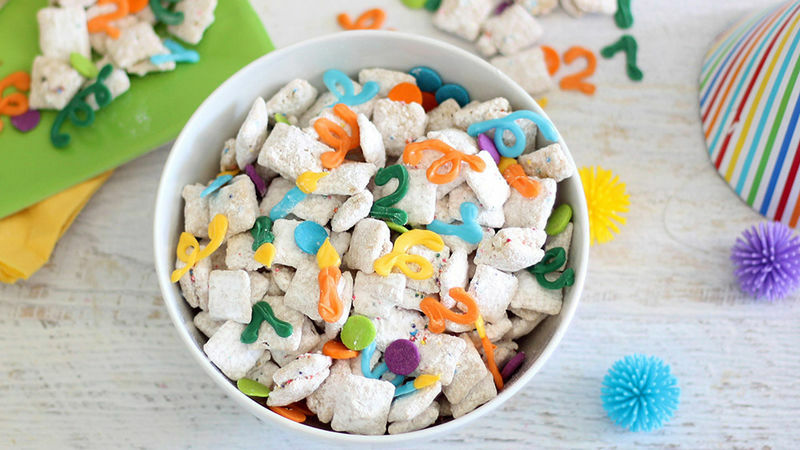 Mix your candy designs into the coated cereal mixture. Add small candies, more sprinkles or whatever you like to make it look fun. Here, I added large confetti sprinkles because, you know – birthdays and confetti sprinkles just go together!